The ABC's are everywhere! This theme provides ideas to explore the alphabet with your group through fun activities that will take you from A to Z. (Open-thematic poster-Alphabet) Print, laminate, and decorate the walls of your daycare with all kinds of posters. 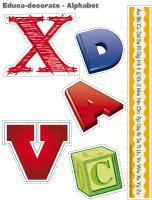 (Open-educa-decorate-Alphabet) Print, laminate, and cut out. Use the illustrations to decorate the walls of your daycare and set the mood for the theme. Attach paperclips to pieces of fishing wire and hang them from the ceiling. Use them to hang letters from the ceiling. Write the name of each child and various objects in big letters and display the nametags throughout the daycare. Use uppercase letters for the first letter of a word and lowercase letters for the rest of the word. Children often have difficulty recognizing lowercase letters. (Open-garland-Alphabet) Print and cut out the letters. Use the alphabet garland to decorate your daycare. The pictures may be used as a memory game or to spark a conversation with the group. Use them to decorate your daycare or a specific thematic corner. 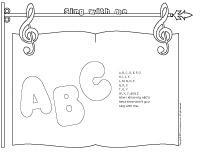 (Open-picture game-Alphabet) Print, laminate, and store in a Ziploc bag or in your thematic bins. This special tool was created in response to a special request received. (Open educ-poster-Letter L) Print and display the poster. Use it to introduce children to this letter. 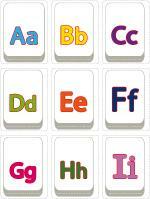 We have prepared colourful letters of the alphabet for you to use throughout the theme. (Open letters of the alphabet) Print and laminate. Sit in a circle with your group and have each child pick a letter. Encourage them to identify a word which begins with the letter they picked (A for apple, etc.). You may also choose to have children pick a letter and then bring an object from home which begins with the letter they picked. During the theme, give children a chance to present their object to the rest of the group. Collect 26 empty boxes (tissue or other box). Identify each box with a letter of the alphabet. Add pictures of items (or small items) which begin with the corresponding letter to each box. Each morning, present a few letters to your group. Leave the boxes on a table for children to explore their content as they wish. (Open stationery-Alphabet) Print. The stationery can be used to communicate with parents, in your writing area, or to identify your thematic bins. 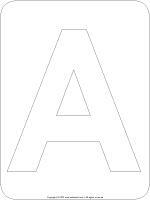 (Open writing booklet-The letters of the alphabet) Print for each child or laminate for use with a dry-erase marker. Children must trace the letters in order to familiarize themselves with the 26 letters of the alphabet. 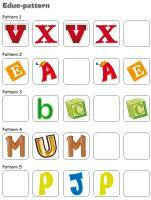 (Open activity sheets-Alphabet) Activity sheets are suggested for each theme. Print and follow instructions. Wooden blocks with letters and numbers on them. Cover the floor with white tiles (don't glue them!) and write the letters of the alphabet on them using permanent markers or colourful adhesive tape. Finger paint and letter models children can reproduce with their fingers. Letter stamps and paint. If you do not have stamps, make your own by carving potato halves. Sponge painting with sponge letters. Letters of all kinds which can be glued assembled, etc. Dollar stores and department stores are a great source. Visit their scrapbooking section. Letters which can be cut out and colored/painted to make an alphabet soup craft. Alpha Bits cereal or alphabet pasta can be glued on giant letters. Hang giant letters on the wall and let children glue all kinds of colourful paper on them. Make your own alphabet bottles. Each bottle represents one letter. For example, in your "A" bottle, you can add beads with the letter "A" written on them, tiny wooden or plastic apples or angels, etc. Coloring pages representing the 26 letters of the alphabet. Various letter stencils for tracing fun. Set up a school area complete with desks, chairs, a chalkboard, giant letters which can be hung on the wall, pencils, pens, erasers, rulers, etc. Display letter posters and include several books in your area. Organize a computer area complete with several keyboards. A cardboard box can represent a computer screen. Add a computer mouse, white paper, CDs, old computer disks, etc. Identify as many items as possible with word flashcards or picture words. Modeling dough with letter-shaped cookie cutters. Magnetic letters and cookie sheets. Letter beads and string. Have older children write their name on their bracelet. Letter bingo (use Alpha Bits cereal as playing pieces). Write the letters of the alphabet on 26 clothespins and find pictures of 26 items (beginning with each letter). Children can associate the clothespins to the correct pictures. Cut letters out of sandpaper, tissue paper, fur, cardboard, cellophane paper, etc.). Various word games for children (Boggle, Scrabble, etc.). Fill a binder with the letters of the alphabet and pictures of items beginning with each letter. Letter stamps and stamp pads. Write each child's name on a piece of cardboard. They will enjoy "writing" their name. Everything and anything which contains letters. Letter game: Set a plastic tablecloth on the floor. Trace/glue giant letters on it. Children must throw bean bags on the tablecloth and name the letters they land on. Letter fishing: Add several magnetic letters to a small pool and use a fishing rod to fish for the letters. Encourage children to name the letters they catch or have them associate them to the corresponding letter on a board. Container filled with Alpha Bits cereal or alphabet noodles. Container filled with rice in which you hide cardboard, wooden, or foam letters. Read a recipe with your group. Discover magnets... with magnetic letters. Sing the alphabet differently: faster, slower, backwards, etc. You can also pause and let children continue singing alone. Point to a letter and explore it through singing exercises. (Open game-This is my spot-Alphabet) Print two copies. Laminate and cut out the cards. Glue one copy of each card on the table using adhesive paper. Drop the other copies in a bag. Children take turns picking a card to determine their spot at the table for the day. You may also use the cards to determine naptime spots or for your task train. Label your chairs using the first letter of each child's name. At snack time or lunch time, children must find a chair with the first letter of their name on it. 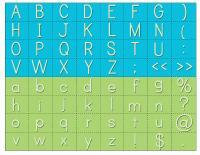 (Open mobile-letters) Trace and cut out different sizes of letters. Decorate them with glitter, ribbon, cotton balls, confetti, etc. Glue the images back to back, on either side of ribbon or string. Hang the mobile from the ceiling or over your changing table. Collect several transparent bottles and fill them with objects which begin with letters of the alphabet. For example, write the letter "A" on one bottle and insert a tiny apple or airplane inside. You will need a large plastic tablecloth. Using a marker, write the 26 letters of the alphabet on it (large letters). Children must throw a bean bag on a letter. Encourage them to name the letter and find a word which begins with the letter. (Open mini alphabet letters) Determine a course children must complete. Complete the course once with them. Then, pick a letter out of a bag and show it to your group. The children who have this letter in their name must complete the course. Each child uses his/her body to represent a letter. The other children must try to guess which letter it is. Glue letters on the floor. Children take turns singing the alphabet and jumping on the corresponding letters. Children search for toys or items which have letters on them. When they find one, encourage them to show it to you. Together, identify the letters or the words. Fill a small swimming pool or large container with magnetic letters. Make your own fishing rods by adding a piece of metal to the end of string tied to broomsticks. Children will love fishing for letters. Invite older children to fish for the letters in their name. Use a small stick to trace letters or words in sand. You can also do the same thing using chalk on asphalt. (Open mini alphabet letters) Print and laminate. Hide the letters throughout the backyard and in the sandbox. Invite children to search for the letters. (Open mini alphabet letters) Give each child a letter, but be sure to hand out two copies of each letter. When you give the signal, children must find the child who is holding the same letter. Deposit several letters in a bag. To the sound of music, children must pass the bag around the circle. When the music stops, the child holding the bag must pick a letter and try to name it. Help the child if necessary. Ask children if they know words which begin with this letter. Stick letters on the daycare floor. Play music and invite children to move around the daycare. When you stop the music, name a letter. Children must find the corresponding letter. The first child to find the letter may choose the letter at the end of the next round. Use your musical instruments to reinvent the alphabet song. 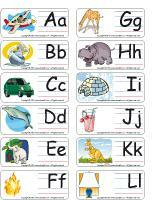 (Open educa-duo-Alphabet) Print and laminate for durable, eco-friendly use. Children must draw a line between items which go together. 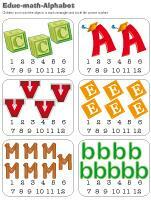 (Open educ-math-Alphabet) Print and laminate for durable, eco-friendly use. Children must count the objects in each rectangle and circle the correct number. 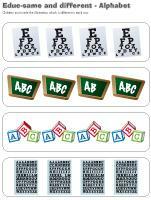 (Open educ-same and different-Alphabet) Print and laminate for durable, eco-friendly use. Children must circle the illustration which is different in each row. (Open educ-pattern-Alphabet) Print and laminate. Children must use the cards to complete the patterns by gluing them in the correct squares using Velcro or adhesive putty. (Open association game-Alphabet) Print, laminate, and cut out. Set the grid in front of a child. Have him pick a letter and deposit it in the correct spot on the grid. (Open bingo-Alphabet) Print, laminate, and cut out the pieces. Play bingo with the letters of the alphabet. 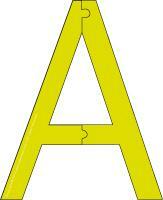 (Open letters of the alphabet) Print, cut out, and laminate the letters. 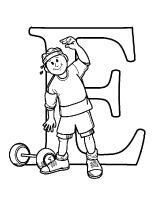 Let children play with the letters and use them to invent silly words. (Open puzzles-Alphabet) Print, laminate, and cut out the pieces. Let children complete the puzzles. Record several different words using a tape recorder (examples: apple, telephone, etc.). Be sure to insist on the beginning sound of each word. 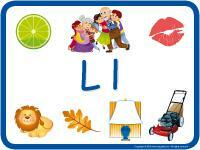 Encourage children to identify the first letter of each word using the pictures from the picture game. Offer chalkboards, chalk, etc. Let children try to write the letters of the alphabet. Provide models. Set up a library corner. Pile books on a table. Add a chair for the librarian, pens, a ruler, index cards, date stamps and stamp pads for return dates, bags, etc. Children can pretend to borrow library books and then sit in a corner to read. Provide a variety of pens, pencils, notebooks, stationery, stencils, and envelopes. Encourage children to prepare a special letter and mail it to them or to their parents. Give each child a medium-sized plastic bag. Let them choose a paint color and deposit 3 tablespoons of paint in their bag. Seal the bag, removing any excess air. Children can use their finger to trace various letters in the paint or to draw pictures. To erase, show them how to simply shake their bag to spread the paint out. Purchase a bag of clothespins and identify them with the letters of the alphabet. Make two series (or more for popular letters). Write the name of each child on a nametag or piece of cardboard or use word flashcards. Ask children to reproduce various words on a clothesline or on the edge of a box by attaching the clothespins in the correct order. This is also a great exercise to build fine motor skills. Instead of using a traditional rice bin, innovate and offer a container filled with alphabet pasta or Alpha Bits cereal. Hide foam letters in your rice bin. Trace letters on cardlboard or Fun Foam and cut them out. Make a small hole at the top of each letter. Children can thread the letters of their name on a string to make necklaces. Variation: Use pasta or cereal letters. Prepare cookie dough. Using cookie cutters, make letter-shaped cookies. Enjoy. Cook small alphabet pasta. Let children manipulate the letters. Offer Alpha Bits cereal as a snack or dessert too. Give children carrot or celery sticks and encourage them to use them to create letters. (Open models-letters) Print one letter for each child. Encourage children to crumple pieces of tissue paper and glue the crumpled pieces on their letter. Sculpt letters in modeling dough or salt dough and leave them out to dry. Let children paint them. Variation: You may also use Magic Nuudles. Hang a long paper banner on the wall of your daycare. Write the 26 letters of the alphabet on your banner. Provide many magazines and catalogues. Have children cut out words and letters and glue them on the banner, under the correct letter. Use letter-shaped sponges to paint. You may purchase them or make your own simply by cutting sponges into letter shapes. (Open mobile-letters) Print, trace the number 8 figure on cardboard, and cut out. Cut out the letters and insert different lengths of string in the holes at the top of each letter. Hang them from the number 8 figure. Add three pieces of string in the holes shown on the figure 8 to hang your mobile from the ceiling. (Open letters-black and white) Print the letters and cut them out. Children can decorate them as they wish. Glue them on Popsicle sticks or drinking straws to create letter puppets. Children will use their imagination and bring the letters to life. Give each child a piece of black construction paper. Have children glue small alphabet pasta on it. Variation: If you wish to offer colourful pasta noodles for this activity or to create a manipulation bin, add two tablespoons of food coloring and three tablespoons of rubbing alcohol (combined) to 1 pint of noodles. Seal with a lid and shake the container gently to coat the noodles. Spread them out in a single layer on a baking sheet and let dry several hours. Provide several magazines and newspapers and encourage children to cut out letters and words. Have them glue them on a piece of cardboard to create a "story". Purchase foam letters at a dollar store (crafts section) and let children use them to create a collage. You may offer a variety of materials along with the letters. Spread finger paint on a piece of paper for each child. Encourage them to trace letters with their finger. Using waxed paper is ideal. (Open creative coloring-Alphabet) Print for each child. Children must fill the book with all the letters of the alphabet they are familiar with. 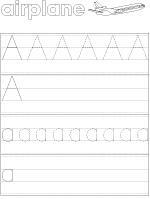 (Open coloring pages theme-Letters) Print for each child.